Watering lawn - Deep and Infrequent or Often and Little? Watering lawn – Deep and Infrequent or Little and Often? The short answer is you should water your lawn little and often. Water daily during establishment, every 2-4 days during the grow out period and more frequently through the heat and dry of summer. To grow deep turf grass roots, provides conditions for optimal plant growth and grow as much biomass as you can. Ensure that turf grass plants are not moisture stressed and have optimal growth conditions. Factors to consider include: turf grass species, season evapotranspiration, water holding capacity of the soil, auto irrigation system, shading, rainfall distribution, mowing regime, pathogens and other. Does watering deep and infrequent promote deep roots and drought hardiness? There is very little scientific evidence to support the premise: that watering deeply and infrequently (weekly) promotes deeper root growth to resist drought. In fact there is evidence support the opposite – because plant biomass growth has been checked (by water stress). 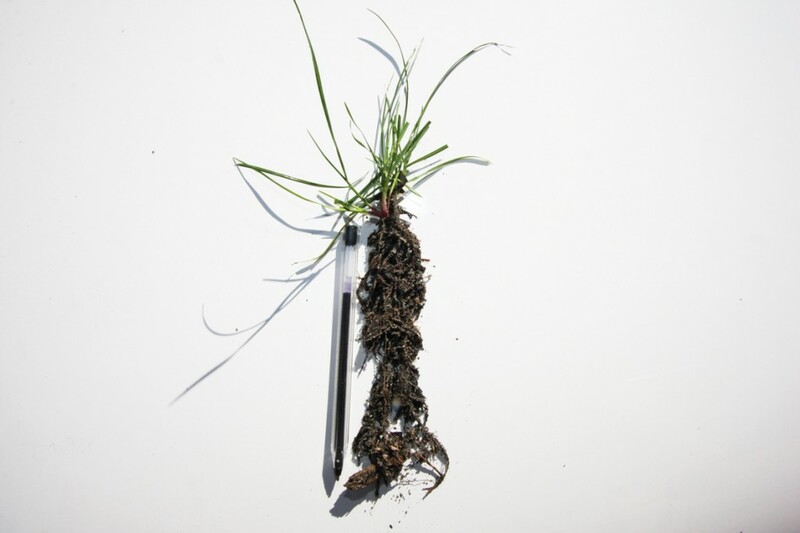 Recommendations for growing deep turf grass roots. In summary: The mechanism for deep turfgrass root growth is root gravitropism or gravity. Hydrotropism (root response to water) is limited to a response a few millimetres from the root tip. It is characterised the bending of the root tip in response to a water gradient. In other words, the root tip cannot ‘radar water’ further down the profile, apart from determining water a millimetre or two adjacent to the root cap. To grow turf grass roots deep into the soil profile. Provide optimal conditions for total plant biomass growth and allow gravity do its job. Irrigate frequently – a little often. Ensure there is adequate soil moisture at 10-15 cm depth – dependant upon the soil type. Program the irrigation controller for early every morning for a couple of minutes only(depending on layout and nozzle type). Fertilise with nitrogen – a little often, after every or 2nd lawn cut. Remember, nitrogen leaches out of the soil profile readily. Mow the turf grass plants removing the top one third of the canopy – mowing from a height of 75mm down to 50mm. About every 7-10 days in late spring, every 21-28 days in deep winter. Maintain a high canopy height (60mm) in summer heat to shade the understory plant crowns. Ensure the plants are getting direct sunlight. Ensure root feeding cockchafer grub is under control. Incidently, Charles Darwin was a pioneer of root gravitropism research. soil type, supplemented by seasonal rainfall. Main objective: 0-30 days – Keep soil moist at 10-15 mm depth. At seeding 0-10 days – Irrigate up to twice daily for 3 minutes (2 mm per watering). At establishment 10-20 days – Irrigate up to twice daily for 3 minutes (2 mm per watering) or once daily (morning) for 4 minutes (3-4 mm). At 3- leaf stage, 30-35 days (heading into winter) – Irrigate every 2 days for 4 minutes . During winter, June, July and August. Turn your irrigation off. September – October – rely on natural rainfall, with a once or twice per week manual irrigation for 3-4 minutes only as needed. November – Turn the irrigation controller back on to water twice per week at 3-4 minutes. December – Irrigate every second day for 3-4 minutes. From mid Dec water every day for 3-4 minutes. January – Irrigate twice daily (4-5 minutes). Early morning (1-3 minutes), in the late afternoon (3-5 mm per day). February – Irrigate up to 3-4 times daily. 4-5 minutes in the morning, midday ( 2 mins), mid afternoon (2 mins), dusk (1-2 minutes). March – Irrigate twice daily, morning (3-4 mins) and afternoon (3 mins). April – Irrigate once daily (3-4 minutes). May – Irrigate once every 2-3 days (3-5 minutes). Keep the soil moist not allowing the root zone (top 15-20 cm) to dry out for more than a 6 hours. Determine topsoil dryness by scratching away the top 1 -2 cm and finger feeling for soil moisture. Dig again at 5 cm. If there is no soil moisture to feel – irrigate.